You may have already heard of the recent stir up about the situation of the Imam in the Ottawa Main Mosque, and perhaps you haven’t. – Light Upon Light: Lecture by OMA Deputy Imam Abdurrahman Al-Hejazy Friday’s after Maghrib prayers click here for details. Bring your family and friends to be enlightened by this wonderful new program for new Muslims called “Fostering the essentials of Faith & the basics of the Muslim way of life” by OMA’s deputy Imam Sheikh Abdurrahman Alhejazi. The program will be held every 1st and 3rd Wednesday of every month from 7:30 till 9:30 P.M. at the Ottawa Mosque. 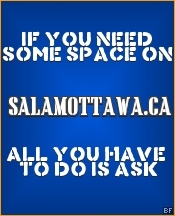 Send us you thoughts before or during the show at salam_ottawa@yahoo.ca and we will discuss them too. We will also let you know over the air how to contact us by phone. Jazakum Allahu khairan for listening and remember… keep the unity, and keep the faith.